In this article I want to talk about your Lead Flow (or Sales Funnel). What I’m talking about in simpler terms is the process in which you keep track of the different stages of a lead…From Prospect to Deal and every step in between. A good CRM will have a clearly defined lead flow. The advantage to this approach is it clearly defines where a lead is and what needs to happen next. Before I get into actually laying out the lead flow, I want to back up a bit and go over good database design. This will help you better understand my strategy and why I’m breaking up my Podio CRM this way. There are basically 3 basic design strategies when it comes to databases. I’ll briefly talk about each below to help you get a better understanding of proper design. Hopefully this stuff isn’t to boring for you, but I promise it will help you see why I setup my Podio CRM the way that I’m outlining later. Like I mentioned before, the Flat File approach is called denormalization. With this approach you are basically putting all things related to a lead in one spreadsheet/table/app. Lots of unused fields. All 6 contact fields (3 name & phone fields) are there regardless of how many contacts a lead has. It is not scaleable. If you need to add a 4th contact, you have to create another set of contact fields (contact 4 name and contact 4 phone). Such a waste of space to only handle a handful of leads. If you want to keep track of additional contact data, such as email address. You have to add an email address field for each contact. That could be 3,4,5 or more fields. The Flat Format is just a very poor design strategy. While it seems simple at first, you’ll soon get overwhelmed with all the wasted fields and one off conditions. The better approach is called a Normalized Schema. Normalization, when it comes to database design, is the process of breaking up your data into related chunks. You then take each chunk and create a separate table (or app…or spreadsheet). Lets make an example out of the Flat File example I showed above…There are 2 chunks of related data here, property address and contacts. This table holds all basic property information that all properties will have, plus a unique identifier..Lead Id. The Lead Id field is needed in order to link records from the contact table to the related property lead. This is where the true advantage of this approach is realized. Instead of having multiple Name and Phone fields, like in the flat file approach, we only have 2 (plus the lead Id to relate it back to a property lead). 3 contacts, there are 3 records in this table. There is no wasted space. And I can add as many contacts for a lead as I want (scalable). Here is a diagram on how my Leads Table and Contacts table relate together. If you want keep track of any additional information, like email address, all you have to do is add a new field to the contacts table. Unlike with the flat file approach where you had to add 3 email fields, one for each contact field. In many cases the best database design is some where in between Normalized and Flat file approaches. You can go so crazy with normalization that it becomes WAY to complicated. Going crazy for a Real Estate Investing CRM is breaking out the phone number and email fields to separate tables. While it allows you to have as many phone numbers as you want it adds another level of complexity that is not worth it. Just holds a name field now (plus the Id fields). VERY Simple table..almost too simple. This will hold the phone number and type of number. This allows you to add as many phone numbers as you need. But how many will you really ever have…3? This will hold the email address and type of email. Same thing as phone table…over kill! I like this approach because I want to be able to see all of Jim’s contact information in one place. Having to go to another table for one bit of info seems over kill here. Hopefully this makes some kind of sense to everyone. There is much more to normalized data then this, but I wanted to keep it as simple as possible. Podio, at the simplest level, is very easy to understand. In fact it’s very much like Excel. Each App could be considered an Excel Spread Sheet within a Workbook. Only difference is that in Podio you enter in information using a Form, while in Excel you would use the spreadsheet’s grid. In Podio you can even view your App data in grid view (or spreadsheet view). If you want to add more data points in excel you add a column, in Podio you add a field to the App Template. Same thing. At the end of the day an Excel Spreadsheet or a Podio App is just a database table. A database table is a place where you store items that share the same attributes. All Motivated Seller Leads share the same basic data points at their initial level. Leads will progress to different stages. Each stage represents a new chunk (remember from above?) of information that I’ll need to keep track of. This logically makes stages a great way to break up my Podio Apps. This is where ALL leads enter into the system. I keep only basic information...anything I get from my lead source. You could add # of Beds & Baths and similar information here, but I chose to put that in my next stage. My thinking was that property details are gotten after a lead has responded. Fields: Property Address, List, Source, Date Entered, Status, Google Map, Zillow Link. Any lead that response (calls, emails or fills out my web form) gets a record here. This is basically my questionnaire form and where I find out the motivation of the seller. Fields: Beds, Baths, Square Foot, Garage, Why are they selling, how much they are looking for...are the types of information that I record here. The next stage in the process is for leads that are motivated. This is where I want to keep track of all my due diligence on the property. This helps me almost have a checklist of what to do. Fields: comps, getting detailed house information, repair estimates and any other information that I need to make an offer. If I make an offer on a house, that offer information is recorded here. Offers is a separate stage because I want to be able to record making multiple offers on the same property. Fields: Offer Amount, Date, Status, Attach the Offer Letter, and any notes. When a house is put under contract a record is entered here for the lead. Just like the due diligence App, this provides me with a sort of check list have items that must be done. Fields: names of potential buyers, contract terms, purchase price, for sale price and Status. I also attach the signed contract to this record. All leads where I close the deal and get paid get a record in this app. This completes the full cycle lead flow. The Deals App gives me a good place to go for historical purposes and at tax time. I also can quickly create a report of which buyers bought what from me. Fields: Closing Date, Sold Price, Profit, referral contracts, buyer, notes. You can easily see that this lead responded (on 8/5/2015), I did my due diligence, made them an offer (of $54,000) and finally got it under contract (for $53,000 somehow). Again, all this information shows up automatically in a Related Items section of a record. Now if I want to see some more details about my contract with the seller, I can just click on the Under Contract item and it brings me to the details. It’s pretty slick! 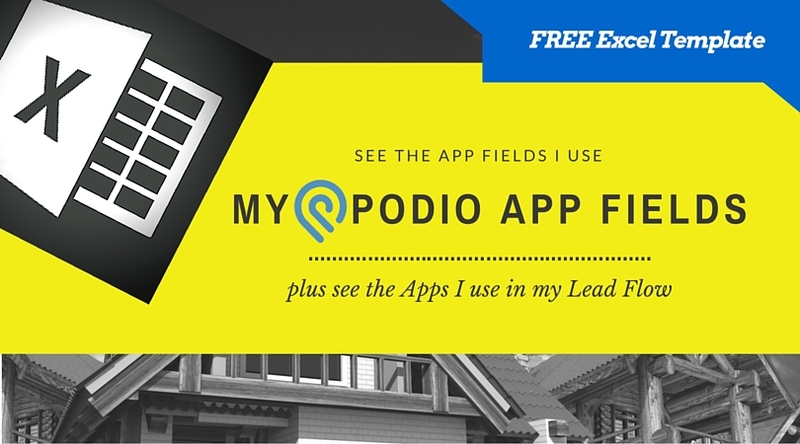 While the Related Items give you a good idea of the status of a lead, I prefer to have a dedicated Status Field for each one of my leads in the Property/Leads App. The reason for this is because I want to be able to filter and create reports based off the statuses. My Lead Status field will pretty much match my stages exactly. With only the addition of a Dead option. 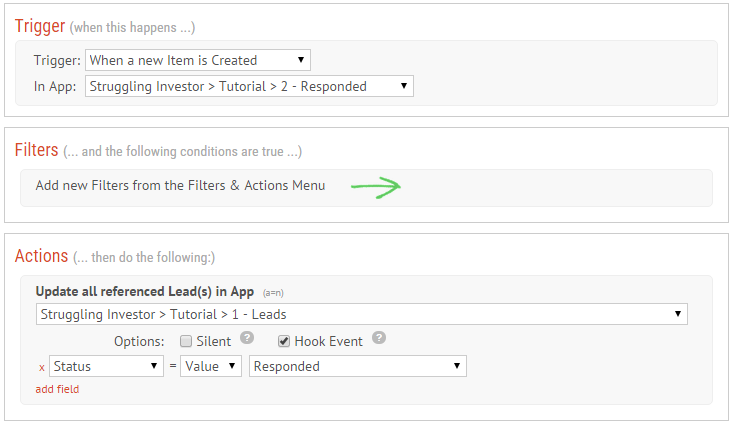 There are two ways you can go about having the Lead’s Status field updated. (1) Manually or (2) us a WorkFlow. Even though you’ll have to either upgrade your Podio account to a pay version or sign up for Globiflow, I recommend setting up a Workflow. The reason for using a workflow is because the less I have to do manually the better. I’ll forget to change the status from time to time if I do it manually for sure. 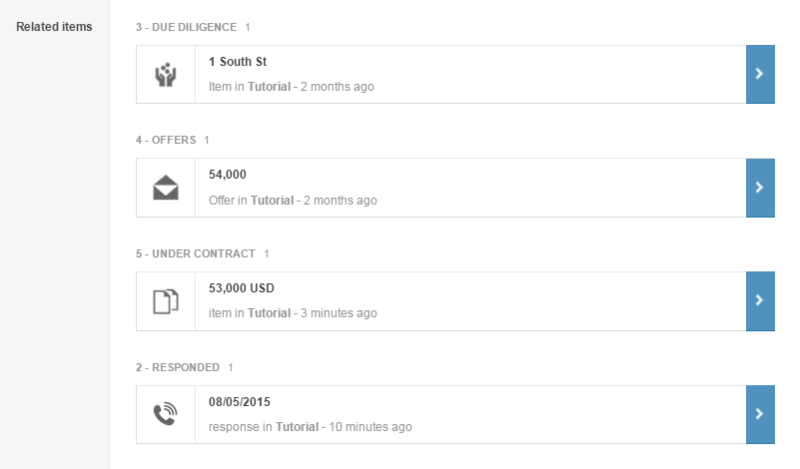 Besides I will be using Globiflow for so many other workflows that it’s totally worth it. Let’s say a lead calls you in response to one of your letters. You go into the your Responded App in Podio and create a new record…linking it to your lead. I have created one of these GlobiFlow processes for each of my 6 stages. It couldn’t be easier and takes very little time to do. I understand that sometimes it’s tough to get started and all that you may need is something to get your brain moving. That is why I put together an excel spreadsheet to help you out. It contains the Apps that are in my basic lead flow, plus all the fields that are within those apps. I did my best to describe what type of fields each on is, plus a short description of what I use each one for (unless they were obvious). I am having a problem setting up mailing with two different addresses one for the location of the property for the letter and one for the address of the petitioner (administrator) that goes on the mailing envelope. I am not currently using Podio but excel as my database. I am just starting my mailing and see many problems with my system in the future. Looking for directions, should I also get Podio and Globiflow then start over setting up SI Lead Manager? So you are wanting to send out a letter to the property address as well as a letter to the administrator (if different from property address) correct? SI Lead Manager isn’t setup to do it that way, it will only print out one letter per property. Podio and Globiflow might do the trick if you set it up correctly. Just off the top of my head, you would probably have to have a separate app to hold your “Mailing Addresses” and relate that back to your “Leads” app. Then use globiflow to create the mail merged letters based off of the Mailing Address app. I’d have to think this one through more but that would be the general idea. Thanks so much for all the info your provide. Podio (and lead management in general) was very daunting until I came across your site. I first heard you on your biggerpockets podcast episode. I do have a question regarding the point at which you enter a prospects ‘ info any of your systems. Let’s say you pull a list of absentee owners from listsource that you plan to start mailing. Would you enter all of those mail recipients into your Podio prospects app before mailing? Or do you only take that step after receiving a response of some kind? I’m torn on when to call a lead a lead and how this affects tracking my campaigns or do not mail requests, for example. Thanks again for your help! The best way to handle this is to have separate entry points for each lead source. For my websites they would go into my websites lead App/Workspace. My Direct Mail lead lists (like ones from listsource) get uploaded into a Separate workspace that I have setup for Direct Mail Campaigns. My main lead workspace is for leads that have contacted me. Once a lead is considered to be worth pursing to any extent they get entered into my Lead Flow. 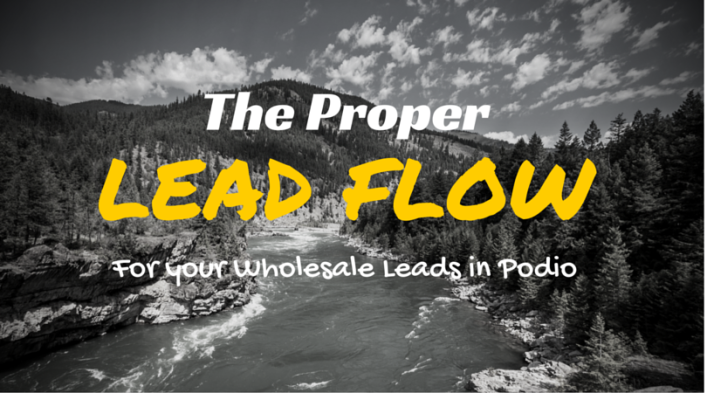 I don’t want lead lists clogging up my main lead flow workspace. The more i use podio the more I’m finding that it’s great to have staging areas for each type of lead. Webforms go into my website app; Voicemails go into my voicemail app; Mailing campaigns go into mailing campaign app. I then either manually scrub those that come in or use a globiflow process to do it (i.e. checking for duplicates). I definitely had not considered using different workspaces, makes total sense though! Thanks for getting back to me. That’s is the best way is to have different lead flow funnels. I love your work and videos. They are very informative. I have a small issue though. I downloaded your Podio app fields template, but there were no app fields on it. Only a statement and a URL pointing back here to this page. Can you assist me? The template should have been emailed to you. If you didn’t get it check your spam folder as it’s been know to get caught up in there. Thanks for this information. In my business I like to think about leads as the people rather than the properties. Sometimes a person might contact me because they want to sell a property and then later they turn into a buyer. Or they might contact me for help with property management and then they turn into a cash investor. Do you have a recommendation on how to handle this? That is a great question. I go back and forth with “is it better to have the Property or Seller as the head element?” question. I ultimately choose to have the property because that is the common ground where all things eventually lead. Kind of like the center of a star. A seller/buyer is always related back to a property and the property is what we care about. What do you do when you have multiple contacts for a property? If you want a more indepth tracking of Contacts/Buyers/Sellers then you’ll have to break that piece out and make it the ultimate Top level. For example, in my new Podio CRM that I’m developing I have a “Leads” App where I then can include Multiple Properties and multiple contacts for that lead. You could have something similar where you have a “Contacts” app where you have the ability to add things like “Properties for Sale”, “Properties Interested in Buyer”,”Other Interests”, etc… Each of those relationships would drill you down into the correct interest. Great stuff Scott!! If I’m using multiple lead sources i.e. Probates, foreclosures etc and uploading my lists into to Podio under their separate sourcing category are the lists getting uploaded into your ‘prospect’ stage then flowing from there? I like to upload lists into specific apps for that lead source. The onboarding is always a little different for each lead type and having separate apps keeps things clean. You then can have a GlobiFlow process that will move the leads into your Lead Management Flow from there. Make sure to have a reference back to the originating app so you can keep records of where leads came from. A single Podio Relationship/Reference field can be linked to multiple Apps. What’s your recommendation on this if Globiflow isn’t an option anymore? Is there a way to do this with something else? There are ways, some hard (learning to code and then leverage the Podio API) and some not so hard but limited like FusionMint. I’ve never used FusionMint before but hear it can do some of the things that GlobiFlow can do. Give that a try. You may also be able to use Zapier in some capacity to do it but I’m not sure. Globiflow was by far the best option. Hopefully they adjust their pricing soon. Scott, thank you so much for sharing this – and in such detail. This is extremely helpful for new investors just needing some guidance to get started with using Podio. It can be a bit daunting at first and your blog really helps. As if the blog wasn’t valuable enough, you shared the spreadsheet! You have saved me a lot of time and I am grateful. Thanks! Thanks Scott for the explanation, I’m totally agree with your reply.